Deciding on appropriate cakes for men can be difficult - especially if they’re not big into golf, football, basketball, or some other sport. 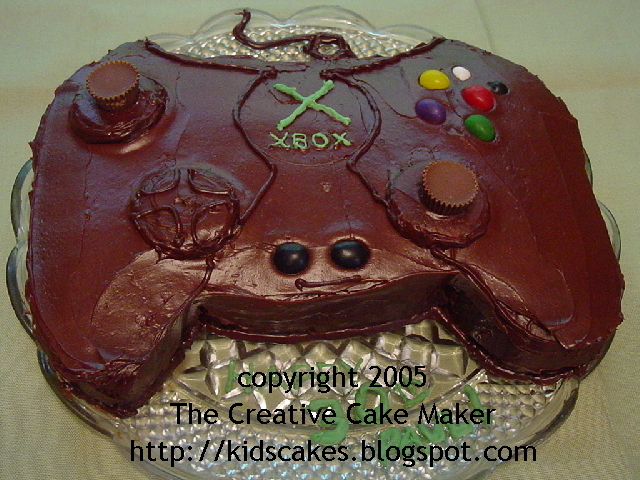 However, if the man in your life loves to play video games (like my brother), it's probably safe to make him a video game controller birthday cake. This is a quick, easy cake-decorating project that can be adapted to whatever video game console resides in your home. It doesn’t take much more than a box of cake mix, some store bought icing and assorted candies and, if your brother is like mine, he’ll be happy to dispose of any extra candies for you. 1 standard box of cake mix (whatever flavor you prefer), baked in a 13”x9” pan and cooled completely - If you need assistance in baking and cooling your cake, please refer to these video tutorials on “How To Bake A Cake”. Draw and cut a template out of wax paper for the basic shape of the “controller”. Any video game controller will do. My brother just happened to like the XBOX (and this is before the new white XBOX 360 came out). The cake is a standard 13"x9" cake. If you have not already done so, bake your 13”x9” cake according to package directions. Be sure to grease and flour the pan thoroughly. Baking spray alone won’t do much good for this cake. Once the cake has cooled in the pan for about 10 minutes, remove it from the pan by flipping it out onto a wire cooling rack. The easiest way to do this is to place a wire cooling rack on top of the pan and, using a hand on either side to keep the rack and the pan clamped together, flip the entire pan over. Set the rack down on the counter top and gently lift the cake pan to remove. If some of the cake sticks to the pan, just use a scraper to remove it and place it back on the rest of the cake. It won’t show once the cake is decorated. Continue cooling the cake completely. If it is not cooled, your icing will start to melt and slide off the cake. Transfer your cake to a large cutting board. Place the template for your controller on top of the cake and carefully cut around it. Set aside the excess cake. You won't need it and you will have something to munch on while you put the cake together. You could save it for later to serve slightly crumbled in a bowl with ice cream and chocolate syrup. Place your cake right side up on the plate you will display it on. If you prefer, you can place your cake on a cake board (cut to the shape of the cake) and move it to it’s permanent home once it is completed. However, most of us don’t have cake boards handy. The cake pictured here is resting on a large glass plate. I chose to ice the entire cake in chocolate icing because I wasn't about to try to make that much black icing...and I didn't want to EAT that much black icing. Using your spatula, ice a thin layer of icing all over the cake. Pay particular attention to the sides where you made your cuts. This layer of icing is meant to “seal in” the cake crumbs so they don’t get all over your finished cake. Allow the icing so set and firm up a bit. Ice the entire cake as usual with a nice thick coating. For this particular cake, use the picture (or an actual XBOX controller) as a reference for where the Oreo cookies should go. Push the Oreo’s into the cake until just the top cookie is above the surface of the cake. Lightly ice over them. For the controller joysticks, unwrap two Reese's peanut butter miniatures and place them upside-down on two of the Oreo cookies. To create the “outlines” of the controller, fill one sandwich bag 1/3 full with some chocolate icing. Push the icing toward one of the bottom corners of the bag. Snip a small hole in the corner of the bag with your scissors. Twist the excess bag to create a decorating “piping bag”. Place the “twist” in the joint between your thumb and the rest of your hand. Close your hand over the rest of the bag. View a video tutorial for this step if you are unsure how it should be done. To decorate your cake, you will squeeze the bag. Try it a little on some wax paper to get used to it. Now, take the piping bag and, using the picture as a reference, pipe icing onto the remaining Oreo to create a “directional pad”. Then, pipe icing to outline areas of the controller. In this case, a little bit of piping was all that was needed to draw attention to the XBOX written in the middle of the cake. Pipe a curling “cord” on the plate coming out of the back of the “controller”. The buttons are all made of jellybeans. One white jellybean, 3 black, one yellow, one red, one green, and one purple (I didn’t have a blue one). Two black one are used to create the “start” and “back” buttons at the bottom center of the controller. The red, yellow, green, and purple (or blue) ones make up the “A”, “B”, “X”, and “Y” buttons. For the black and white buttons on the controller, since they are slightly smaller, cut both the black and white jellybeans in half before positioning them on the cake. Melt down some green candy wafers and spoon the melted candy into a sandwich bag. Allow the candy to thicken up a little bit so it will be easier to pipe onto the cake. Cut a hole in the corner of the bag just as you did for the icing. This should be a tiny hole. Then pipe the XBOX “logo” in the center of the cake. You can use any extra melted green candy to write a message to the guest of honor. A good place for this would be directly on the cake plate between the handles of the controller. Congratulations! You have just completed a cake that men (and boys) would be proud to dig into! I think that is so creative and I love all the thought you put into it! Great Job!